You can’t dance at the after-funeral party unless you have been to the funeral. You can’t truly appreciate the glory and color and music of the resurrection unless you have felt the hard cold stone in front of the tomb. 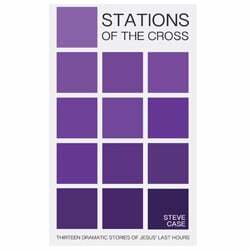 Stations of the Cross is a book of thirteen creative and dramatic lessons that will take participants into the last moments of Jesus’ life. Those who venture into these words will smell the sweat. They will feel the blood roll down his back. They will be taken to the dark place within their own souls and be invited to leave all that baggage behind in the tomb. Utilizing scripture, dramatic readings, and thought provoking questions, Steve Case provides a unique approach to curriculum that can easily be customized for individual or group use. Product includes PDF and editable word files of sessions, plus PowerPoint backgrounds and other graphic files for use in group settings or teaching contexts.